A new song with more momentum than ever before! “Qualia” is the new song by UVERworld, and the theme for “Mobile Suit Gundam 00-A Wakening of Trailblazer-: The Movie” – a ballad single, performed with all the band’s strength. 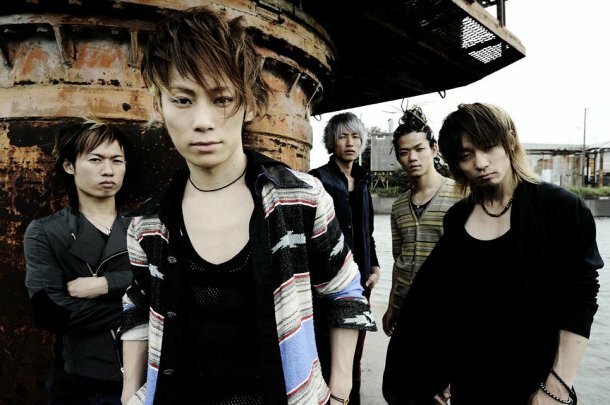 We speak with UVERworld about their emotions after their recent tour, which forms basis for the song’s magnificent worldview, as well as their other thoughts on this new song. The theme song with more momentum than ever before! --Did you write “Qualia” after getting the offer to work on the “Gundam” movie? Takuya: We did. Before we wrote this song, we had maybe two chances to meet with the director to talk. We deliberately asked about his passion for the movie, and the reason he wanted us for the theme song. --Why did he choose UVERworld? T: It seems that before, when working with the TV version, he was really impressed with our attitude and the way we approach the music. We were also confident in these things, and yet crowning the conclusion of an important movie really used us up. We had more momentum than ever and created 10 songs in total. Usually we can’t create songs with a single unifying theme, but we extended the deadline three times, and this song was the very last one that we wrote. --It’s a very beautiful song. The lyrics also have a certain universality, and the words build strongly one on the other. T: The lyrics encompass the worldview of the movie, while also linking up to my own emotions in many places. That is to say, I felt very fulfilled by our last tour, and when it was over I felt incredibly lonely. That’s what inspired the line “Aenai hi no sabishisa ga / Hora / Issho ni iru jikan no jujitsusa wo shoumei shita” [“Can’t you see? / The loneliness of the days I can’t be with you / Is proven by the completeness of the time we’re together”]. Also, the line “Arikitari na kotoba ni / Zenbu wo komeru yo” [“Everything’s included / In these ordinary words”] were influenced by the overflow of emotions that I felt – but couldn’t clearly express – during my MCs in the Osaka live. Shintaro: I also felt a kind of grief after our last tour came to an end, so when I hear these lyrics, it really hits me hard. I remember the live and it chokes me up. --What’s it like to sing this song? You use a much higher pitch than usual. --So even you just relied on what everyone else said. (laugh) “Qualia” goes in one direction, in which a nervous tension makes up a delicate song, but in the other direction you have “Wakasa Yue Entelecheia,” a song with a lot of destructive power. The interesting thing about UVERworld is your ability to bridge the gap between these two extremes. T: Akira and I wrote the first four lines of “Wakasa Yue Entelecheia.” The next two were written by Shintaro, Nobuto and Katsuya, so it’s a song that was created from various other songs. In the middle it gets pretty sloppy, and even we don’t know where it’s going. (laugh) But we thought it was a song with a lot of potential, so we wrote it and had some fun with it. We play it as though we’ve run out of time, and through that the listener is able to get a sense of what drives us. --So which is more fun to create: a song like “Wakasa Yue Entelecheia” that’s written fast and loose, or a song like “Qualia,” that you had to purposefully hunt down? T: I have to be honest, “Qualia” just isn’t the song that I’m satisfied with and that’s crammed full of stuff I like. But “Wakasa Yue Entelecheia” isn’t the kind of song that touches the spirit, or about which we can feel a sense of accomplishment for being able to hit home with our listeners. It’s hard to say which is better.